Word is spreading about the death of one of the iconic (and most oddly named) figures of the Sunset Strip — Filthy McNasty. McNasty, whose eponymous nightclub was the predecessor to what now is the Viper Room and who also owned F.M. Station in North Hollywood, died of cancer on April 13. His death at the age of 73 was disclosed on his Facebook page on Tuesday and has drawn comments from several dozen friends and co-workers. They include local rockers and James Rogan, a U.S District Court judge in California and a two-term member of the U.S. House of Representatives. 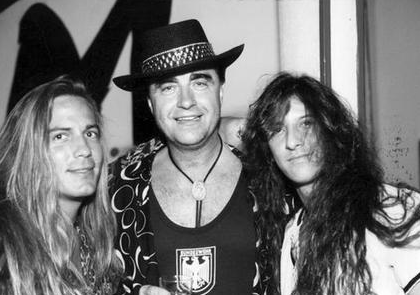 Filthy McNasty (center) with Shawn Crosby and Micky Perez of Jones Street. Wolfgang and Nasty (who was born as Wilfried Bartsch before the brothers legally changed their names) moved to the United States from Berlin in 1956 according to Leigh Montville, author of “Evel: The High-Flying Life of Evel Knievel: American Showman, Daredevil, and Legend.” They began working in the restaurant business and eventually took over the Melody Lounge, at 8852 Sunset Blvd. near Larrabee, a hangout where Bugsy Siegel and Micky Cohen and other gangsters were said to gamble. Renamed as “Filthy McNasty’s,” the bar became a popular hangout for Evil Knievel and Phyllis Diller, Elvis Presley and Mick Jagger and other celebrities such as Little Richard and John Wayne who appreciated McNasty’s ban on photographers. Central opened in 1993 as the Viper Room, with actor Johnny Depp then a part owner. It was known for a while as the place where Hollywood celebs hung out and infamously as the place where in 1993 actor River Phoenix died of a drug overdose. Today its owners include Harry Morton, son of Hard Rock Cafe co-founder Peter Morton, who is said to want to turn it into a franchise somewhat like the House of Blues. I was a promoter in the 80s for the deaf and hard of hearing people. Filthy was so kind to allow us to share his club. It was at the time when there were male strippers. The club was one of the favorites for the deaf and hard of hearing. I think the news media came and did a live coverage. I am sadden to hear the passing of Filthy. My condolence to his family. This Is Flash remember me? I am pretty sure I remember cari jones…..I was a dancer back in 77-78-79-started at the sunset strip and migrated to north hollywood…..Good Times…Good Music …..Good People! I miss you all! Hope life was kind to all of you!And from my perspective Thank You for Living in this World! My husband and I also lived in those apartments, but it was in 1971. I am visiting LA today so I drove by and stopped. I wondered if thecbrothers still owned them. Then I looked up this article. Didn’t know them that well, but I knew they were Party Guys!! A guy named Steve lived next door to us. We had the first apartment next to the street. I rented an apt on Wilcox (Filthy owned a 4plex) and yes he did own and drive around in a black hearse. He had a girlfriend named Pearl. 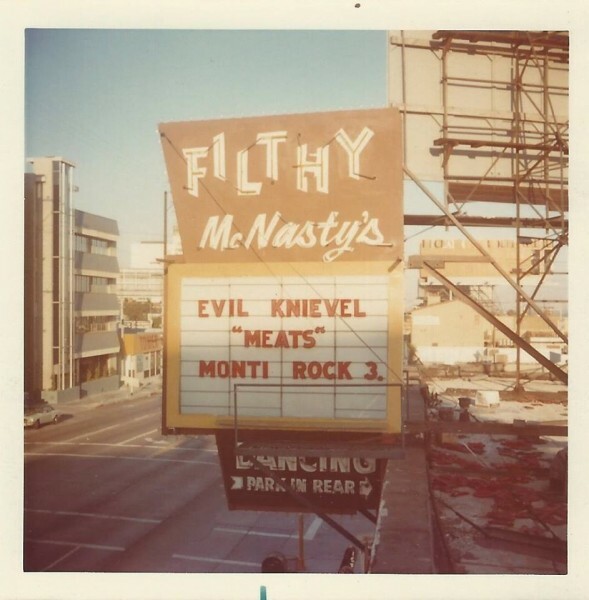 I also worked at Filthy McNasty ‘ s on Sunset, I was 21 and after 2:00 am would go to the Valley and work till 7:00 or 8:00 am Evel K(Kneivel) would be sitting at the bar many “nights”. Some of the best times I had iin Hollywood were with Wolfgang (he hired me on Sunset) and the gang. 1976-1978. Hey you Terese Jones…….you lived upstairs. This is Cari Jones . Filthy McNasty (and his foxy filthettes) was a significan time in my life. Remembering with fondness!